April 5, 2019 -- Researchers from the University of Arkansas in Fayetteville have published results from a study testing a new ultrasound imaging method for the detection and diagnosis of congenital heart disease in infants and children. The new technology, called vector flow, creates images of the internal structure and blood flow of children's hearts. It was used for the first time in humans at the Arkansas Children's Hospital in Little Rock, according to a team led by Dr. Morten Jensen, PhD. The study was published March 5 in Progress in Pediatric Cardiology. About 1% of babies are born with congenital heart defects. Pediatric cardiologists identify congenital heart disease using echocardiography and other processes based on ultrasound, the researchers wrote. Although effective, ultrasound can't accurately obtain details about blood flow within the heart. The team used an ultrasound scanner with vector flow imaging to image the hearts of two three-month-old babies, one with a healthy heart and one with congenital heart disease. 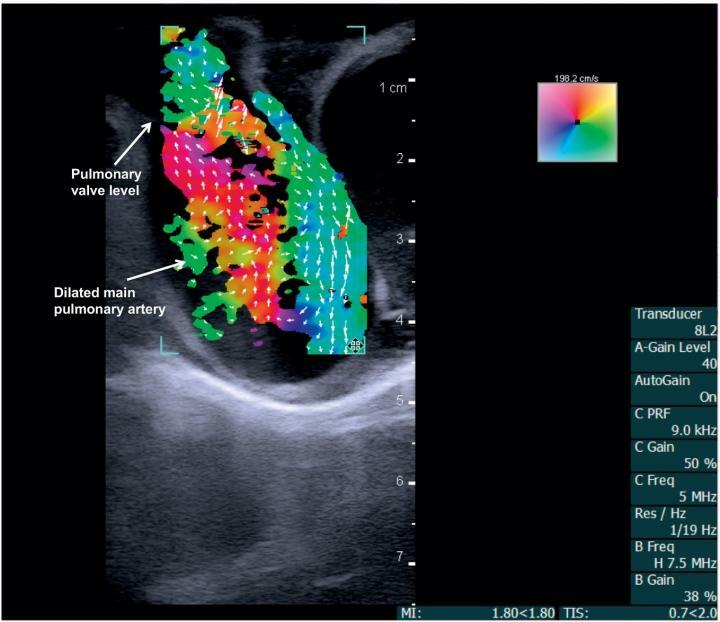 The technology allowed for complete transthoracic imaging of tissue and blood flow at a depth of 6.5 cm; abnormal flow and cardiac anomalies were clearly visualized in the child with congenital heart disease. Vector flow imaging demonstrates swirl of blood flow within the dilated main pulmonary artery of a pig. Image courtesy of Dr. Morten Jensen, PhD. "Vector flow imaging technology is not yet possible in adults, but we have demonstrated that it is feasible in pediatric patients," Jensen said in a statement released by the university April 3. "Our group demonstrated that this commercially available technology can be used as a bedside imaging method, providing advanced detail of blood flow patterns within cardiac chambers, across valves, and in the great arteries."